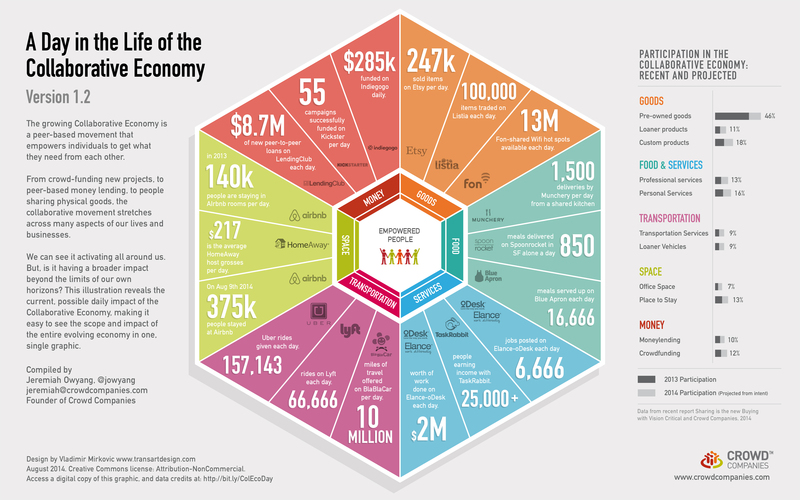 See the original Honeycomb graphic, which spurred this “Day in the life” graphic. Data shows collaboration in the new economy is accelerating. People are crowdfunding, making, sharing, collaborating, all kinds of their things in life. Some are getting food on-demand, rather than going to traditional grocery stores or restaurants. The world is speeding up, and people are transacting between each other, or rapid-delivery services. We expect this to continue to accelerate as the funding from VCs dwarfs many markets, adoption rates are doubling, and the media has endless coverage over this collaborative movement. To help make sense of this dizzying environment, we attempted to take a snapshot of this world in motion, to try to find out what a single day comprises of. Data was aggregated from online sources, first, then in many cases, I asked for clarification from startups contacts that I know. All data was from 2013-2014 sources. Only four of the eighteen sources are from 2013. Some companies declined to provide data, or it wasn’t listed, therefore we did not include. In many cases, data was annual, or monthly, and we divided to find out an average daily rate. In many cases, companies would not provide a daily rate, so we had to conduct this exercise on our own. Vision Critical and Crowd Companies partnered to obtain this data, read the report Sharing is the New Buying. The Mesh Directory, by industry leader Lisa Gansky lists out over 9,000 companies in this market. See VC funding of this market, on a Google Sheet I manage. An older collection of stats and figures in this market. Full body of work, research, data, reports, and slides. Contact: If you’ve recent data on your startup growth, please send to me directly at jeremiah at crowd companies.com. You can read the designer, Vlad at TransartDesigns.